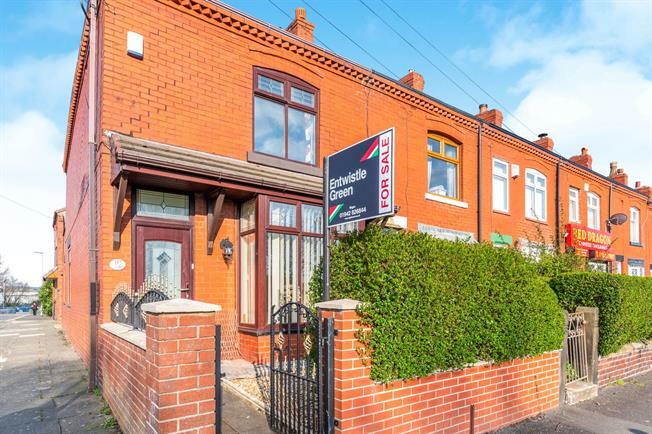 3 Bedroom End of Terrace House For Sale in Wigan for Asking Price £100,000. Stunning family dining kitchen with a range of wall and base units with complimentary work surfaces. Integrated gas hob and electric double oven. Under stairs storage and large family area. Two UPVC Double glazed windows to side and rear and UPVC back door. Fully tiled low level W.C and vanity wash hand basin. Enclosed low maintainence front garden with gravel area, wrought iron fencing and gate. Double gate gives access to the rear where there is an enclosed rear yard area .